Sometimes you land up with overripe Papaya or sometimes Papaya is not at all sweet. So rather than making Papaya Halwa every time, make Dashami using Papaya, Jaggery and enjoy it for breakfast / evening snack. 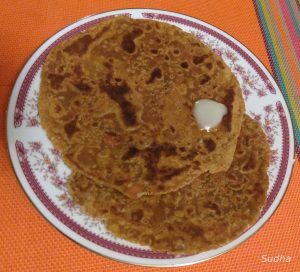 Dashami is sweet Roti (Indian Bread). 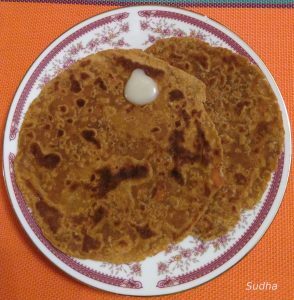 This is an easy recipe that makes delicious and nutritious sweet layered Rotis using ripe Papaya. 1. Using a grinder, make a smooth paste of Papaya. Do not add water. 2. In a Wok, heat Papaya Paste. 3. Keep Sauteeing on low flame till excess moisture reduces. Leave it to cool. 4. Add Jaggery, sesame seeds, cardamom, cinnamon, salt to Papaya paste. Mix it together. Add wheat flour and bind a stiff consistency dough. Do not add water. 5. Add a teaspoon oil and bind the dough. 6. Take a lemon size dough ball. And roll a round Puri (small circular shape about 3 inch diameter). 7. 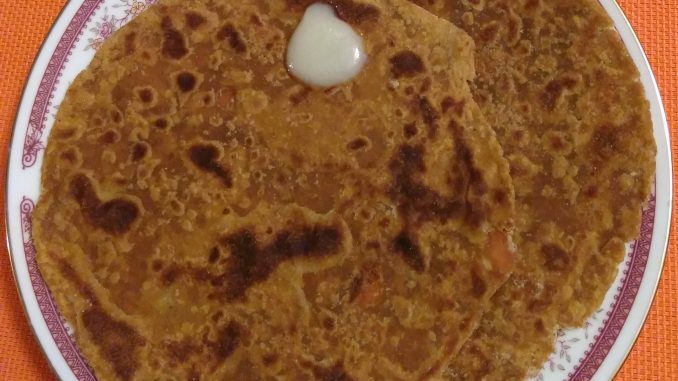 Apply ghee, sprinkle wheat flour and fold it 4 times to make a small square. 8. Roll the square into a thick roti. 9. Roast it in hot Griddle on medium flame on both sides. Apple a few drops on ghee on both sides while roasting. 10. Delicious and Nutritious Papaya Dashami is ready. Serve hot with home made butter / ghee. कधी कधी पपई जास्त पिकते किंवा कधी कधी पपई अगदी बेचव निघते. दर वेळी पपईचा हलवा बनवण्यापेक्षा पपईची दशमी करून बघा. खूप छान खुसखुशीत दशमी नाश्त्याला बनवली की सगळे आवडीने फस्त करतात. आणि ह्यात मी गूळ घालते त्यामुळे साखरेच्या पदार्थ पेक्षा ही दशमी पौष्टिक असते. १. मिक्सरमध्ये पपईची पेस्ट बनवून घ्या. २. एका कढईत पपईची पेस्ट घालून मंद आचेवर ढवळत रहा. पपईच्या पेस्ट मधलं जास्तीचं पाणी आटवून घ्या. ४. पपईच्या मिश्रणात गूळ, तीळ, दालचिनी, वेलची पूड, मीठ,घालून मिक्स करा . त्यात मिक्स होईल तेव्हढी कणिक घालून घट्टसर गोळा बनवा . थोडं तेल लावून मळून घ्या. ५. पिठाचा लहान गोळा घेऊन २ किंवा ४ घडी ची पोळी लाटून गरम तव्यावर तूप सोडून भाजून घ्या. ६. लोणी / तूप बरोबर सर्व्ह करा. ७. घडीच्या पोळीला छान पापुद्रे सुटतात आणि पोळी खुसखुशीत होते.